From left: Abigale Reisman, Jonathan Cannon, Peter Fanelli, Nat Seelen, and Kirsten Lamb of Ezekiel’s Wheels. 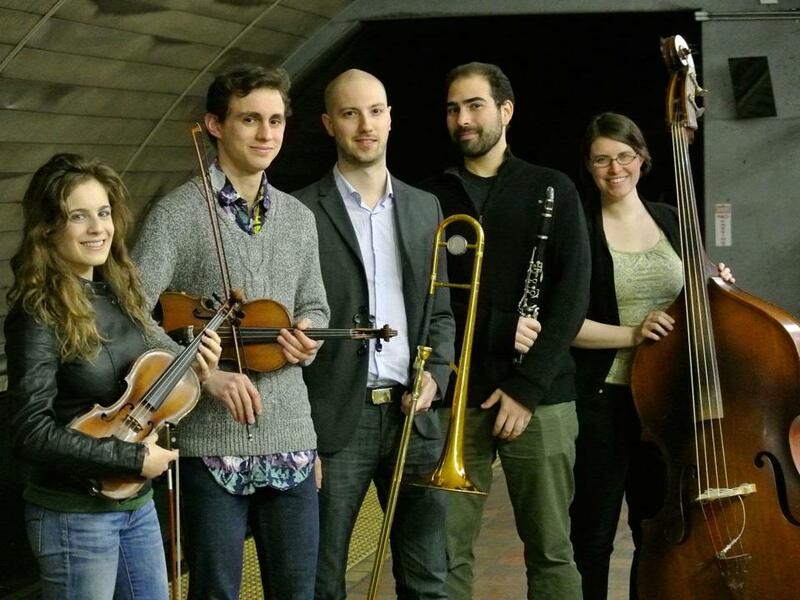 7 p.m. they’ll play at the Coolidge Corner Theatre in Brookline, and in late summer or early fall, their first CD, “Transported,” is due out. But it took a while — for all the right players and instruments to fall into place. Reisman , who had just graduated from Manhattan School of Music and was about to move to Boston to pursue a graduate program at New England Conservatory. The audience award at the International Jewish Music Festival was, of course, a big boost for the young band. “They were a very professional ensemble, and they radiate a very positive atmosphere. They make you happy to watch them,” said Ken Gould, the festival’s director in 2012. He said they made a video explaining who the band was and what they needed the money for — plane tickets, accommodations, and renting a bass. “We were shocked to find out there were so many people who were so generous and supportive,” he said. “Within about a week, we had most of the funding that we had requested. And we raised over $5,000." And the connections they made are not just in the United States.